Two of the founders of that pharmacy formed a separate pharmaceutical firm, Ameridose, in 2006—and that company has also been mired in controversy. This summer, it was accused of poor quality-control practices, specifically not separating sterile supplies from non-sterile supplies, that put patients at risk. Ameridose denied the allegations and filed a defamation and slander lawsuit in response, which was settled last month. In the wake of the meningitis outbreak, Ameridose agreed to temporarily shut down yesterday so regulators can carry out inspections, a move officials say is simply a precaution. Also yesterday, Massachusetts Gov. 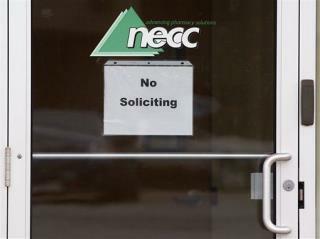 Deval Patrick said NECC—which has also shut down operations and recalled the tainted drug—may have exceeded the scope of its license by selling large batches of prescriptions; a company spokesperson says the pharmacy is cooperating with investigators. Listen up Republicans - this is what deregulation gets us. There will be the usual lawsuits, of course, but that remedy is woefully insufficient. People should go to prison over this. PRISON. With the political season in turmoil, it might be a good sign if some legislators jumped on this situation to file legislation extending the FDA's enforcement to ANY COMPANY making, compounding or having anything to do with putting medicine, drugs, etc., on the market. This story notes the folks owning the company have a short history of just starting a new company when they get into trouble. Come on Congress, let this be a bi-partisan bill! !